The 57-year-old father-of-three was diagnosed with terminal lung cancer last year. GERRY COLLINS, A father-of-three who appeared in a hard-hitting HSE anti-smoking campaign in which he talked about his terminal lung cancer, has died of his illness. The 57-year-old died in his sleep surrounded by his family on Sunday morning. Today, the HSE said they believed his ads had helped over 60,000 attempt to quit smoking this year. The HSE paid tribute to Gerry Collins, offering sympathies and condolences to his family and friends. The HSE estimates that over 60,000 people in Ireland have made a quit attempt this year, thanks to Gerry. O’Brien described this as “something his family and friends can be deeply proud of”. The response from the public, and more importantly from smokers making quit attempts, has been phenomenal. We know that Gerry has saved lives and helped many people avoid the pain, illness and loss that are caused by smoking. Two new adverts featuring Gerry and his family were due to be aired from Ash Wednesday (March 5) this week, said Dr Fenton Howell, National Tobacco Control Adviser at the Dept of Health. He described it as “tragic” that Collins did not live to see them broadcast. Gerry’s QUIT campaign adverts were created on the shared understanding with him and his family that they would continue to be used after he had died. The Collins family have decided that these adverts should be aired as planned this week, in accordance with Gerry’s wishes. Gerry was a great father, grandfather, husband, son, brother and friend, and we are lost without him. We are all incredibly proud of all he did to help others, and the inspiring work he did on the QUIT campaign. He was touched and delighted by the responses he received, online, by post and in person, from smokers and non-smokers alike, and loved hearing the many stories of people who had quit after seeing his ads or hearing his interviews. He wanted to make a difference, and we know that he did. As we say goodbye to Gerry, we would ask that our privacy be respected to allow us time to adjust and grieve for him. Gerry, a businessman who had been a coach at Dublin GAA club Kilmacud Crokes, had originally appeared in an ad in 2011 to encourage people to stop smoking. In the video, he spoke about how he had survived throat cancer after smoking up to 60 cigarettes a day for many years before giving up, and encouraged other smokers to quit. However just two years after the campaign ran, Gerry was diagnosed with lung cancer in the summer of 2013 and was told he only had eight months to live. He and his family allowed the HSE and a film crew to video them over a period of several days about what it was like to be given his diagnosis. In the campaign, Gerry said that he believed that he was one of the 50 per cent of smokers who did not die from smoking before his second diagnosis. “I wish I was an actor [but] the reality is that I’m not an actor. I am dying. I’m dying from cancer as a result of smoking,” he said in the ad. The ad has more than one quarter of a million views since it was uploaded at the end of December. Speaking to TheJournal.ie in December, Gerry said that he believed the campaign would be a “nice legacy to leave behind” if it managed to encourage someone to give up smoking. “I’m sorry I didn’t do it earlier,” he said at the time. “It was very difficult to know that I paid the primary role in my downfall”. He said part of the reason he had been involved in the campaign was for his children and his family. “I think I underestimated the degree of difficulty for them but now they’ve gone through it [the campaign], it was a kind of binding thing and something they can look back on and say “we did this with Dad together and what a great thing to do”". His daughter Lisa posted on Facebook about the death of her father. “Our Dad, Gerry Collins, passed away this morning peacefully in his sleep and a “happy man”,” she wrote. Email “Gerry Collins, who appeared in hard-hitting anti-smoking ads, has died”. 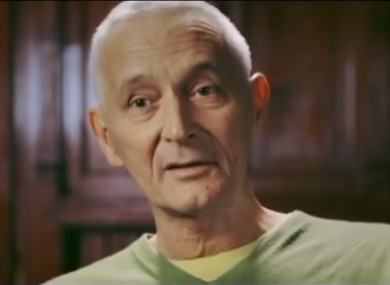 Feedback on “Gerry Collins, who appeared in hard-hitting anti-smoking ads, has died”.